The afternoon Intermediate ride at an advanced pace was led by a local Singlespeeder by the name of Ben and could that guy hammer! In fact he was riding a rigid Siren 29er and except for the catch up stops, I never saw him. We started out with four single speeders and three gearies. At one point, the two gearies took off on their own and we picked two more gearies, both of which hailed from Groton, CT. 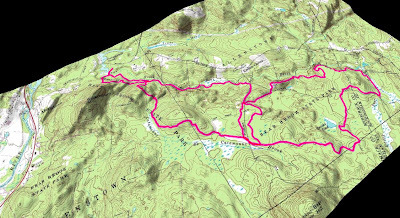 The intermediate ride was 13+ miles long with a mixture buff singletrack, great climbs, awesome descents, and of course typical rooty, rocky New England singletrack. The trails reminded me a lot of Massaoit State Park. Now this guy is a contridiction, he was riding a rigid MisfitPsycles diSSent, with a 25t gear and a full face helmet. He told me at the start of the ride he broke his nose earlier in the season, mountain biking, and decided for a little extra facial protection. At rest stop, Ben practiced his track stands while we all looked on. The guy in the MTBR jersey, earlier in the day did a chest plan on the practice skinny at the venue. He was a trooper but would be hurting later. And more ironically, the guy pictured above right is a NEMBA member who called me out of the blue looking for biking recommendations down in Fairfield County. Some where out on the trail we ran into some novices and gave them advice on how to get back to the venue. Funny, that for such a large area that people would venture off the marked path and wind up getting lost.